Any coach, assistant coach, team trainer, team manager, referee, club or district board member, WYSA administrator, WYSA Board of Directors member, independent contractor, or any other individual seeking affiliation with WYSA or WYSA Affiliated Clubs who has direct or indirect contact or influence on a youth player is required by WYSA to complete a Risk Management Disclosure, every two years through WYSA’s online risk management system. Poaching is considered a serious offense by Wisconsin Youth Soccer Association (WYSA) and any club or individual found to have committed a poaching violation as defined by the WYSA Poaching Policy shall be subject to a significant sanction. Responsible representatives may include parents of team members, team managers, coaches, club board members, directors of coaching and others perceived as an agent of the club. WYSA has adopted US Soccer’s Concussion Initiative, effective immediately. Please review the complete policy for specifics related to youth players heading the ball. Also note, referees will enforce this initiative according to the age of the competition. It is the responsibility of coaches and club officials to address player heading for players who are playing up and would be affected by the policy restrictions. 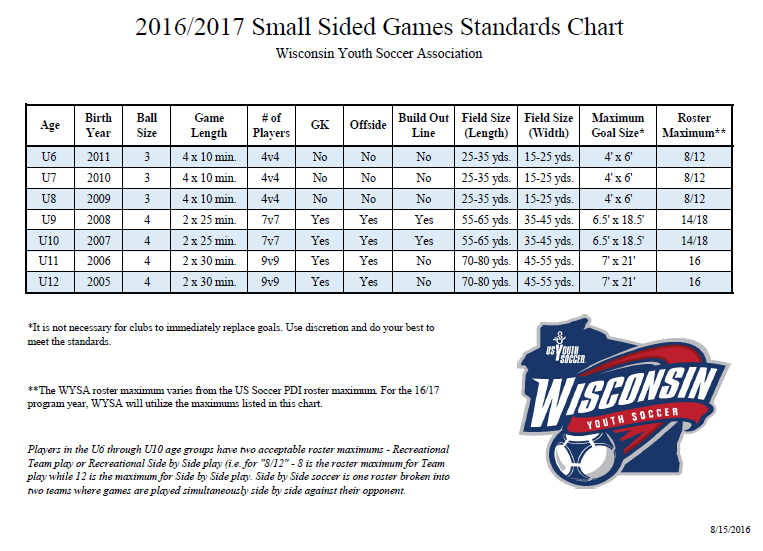 The youth academy policy applies to clubs who are designated as “Certified Youth Academies” by the Wisconsin Youth Soccer Association. (The criteria for the youth academy certification are outlined by the program, in WYSA accreditation documents.) This policy governs acceptable timing of, and contact with players, as well as the registration of academy players to clubs who are WYSA Certified Youth Academies. The youth academy policy aligns with the WYSA tryout policy. A team must be coached by an individual who is appropriately licensed for the age group and competition level being coached. If the coach is not appropriately licensed, that individual is not eligible to coach the team during sanctioned matches. All coaches, head and assistant, must be properly licensed.